With Visual Reports you can easily generate eye-catching reports that are based on your submission data. 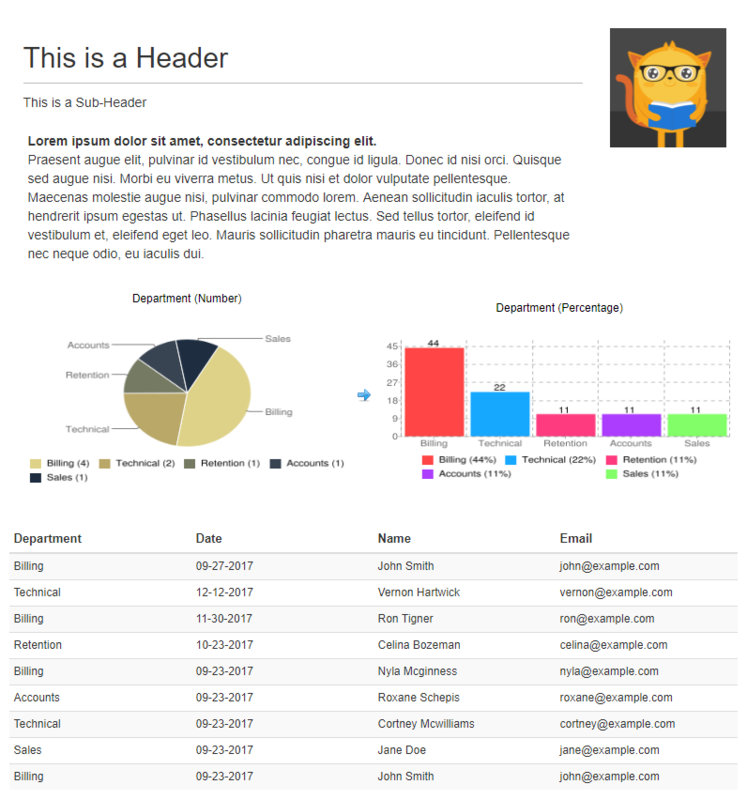 It allows you to create and generate bar graphs, pie charts, line graphs, form submissions grids, and HTML texts and images. 5. On the modal popup, choose VISUAL REPORT BUILDER then click NEXT. 6. 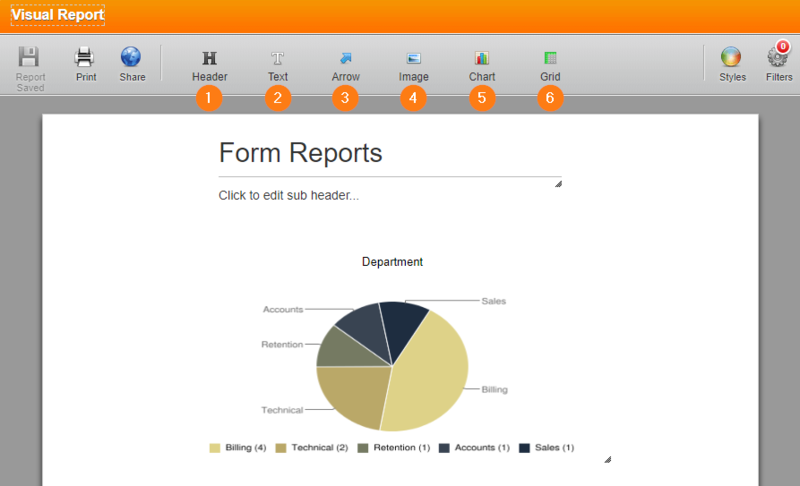 You will be redirected to the VISUAL REPORT BUILDER page where you can customize the report. When you create a new Visual Report, the system will automatically create up to two example charts for you, from your submission data (provided you have the supported field types on your form). 7. Once you're finished building, you can choose to SAVE, PRINT or SHARE the report. 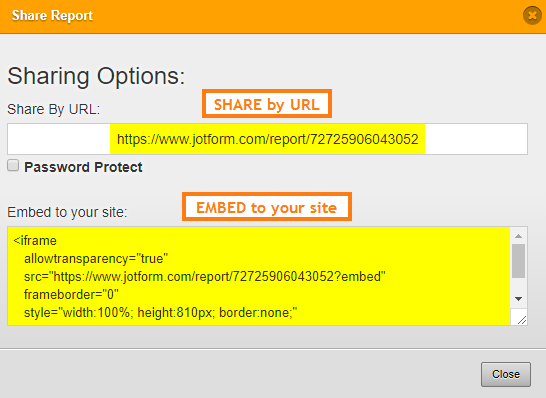 When sharing, you have the ability to either share the direct link to the report or embed it to your website in an iFrame. For added layer of security, the report can be password protected. 1. HEADER - Use this to add a report title and a short description. 2. 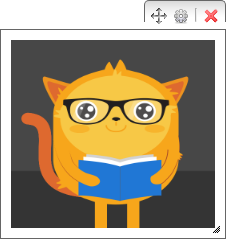 TEXT - This Rich Text Editor can be used for adding long paragraphs. 3. ARROW - Use this to point at items in your Visual Report. The arrow widget is composed of the following directions: North, East, South and West. North East, North West, South East and South West. 4. IMAGE - Can be used for adding your own company logo. 5. 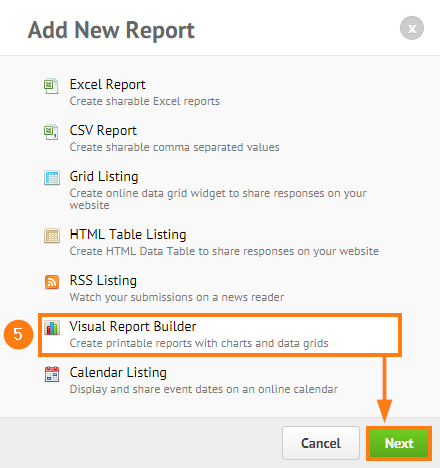 CHART - The main feature of the Visual Report Builder. Use this to visually present your submission data in a chart. There are a couple of Chart Types to choose from: Pie, Pie 2, Bar, Bar 2 and Line. To change the CHART TYPE, click the chart > the GEAR icon > then pick the Chart Type you want to use. 6. GRID - Aside from creating a single grid report. You can now add this tool in your Visual Report. Generally, each of the 6 widgets above have its own respective settings. You can customize each of them by clicking the GEAR icon. Don't forget to click the OK button everytime, to save your changes for each. 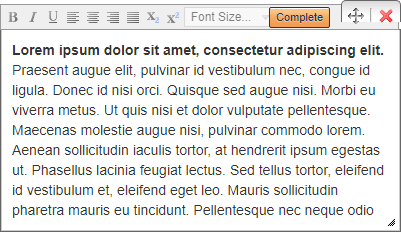 IMPORTANT: It's not possible to create a multi-page Visual Report but, you can can adjust the overall height of the report canvas by dragging the resize handle at the bottom-right hand corner of the page. 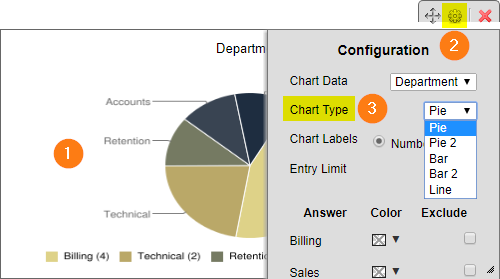 What's New on Chart Configuration? 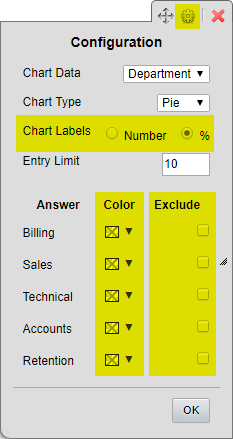 You can now change the CHART LABELS to show either a NUMBER or a PERCENTAGE, an option to EXCLUDE fields and the ability to assign different COLORS per field. To access these options, click your CHART and open its settings by clicking the GEAR icon. And it is also impossible to create a filter with the age of participants. Could you explain me how to do this, and if it is impossible to do, how to modifiy the already done forme to make this possible.. This is really a key element of our reserach, without this, we will have to choose another software..and redo the all work..
Is there a way to generate a visual report for multiple forms? We'd be looking to generate a report of how many submissions have been made of each form (up to 15 forms) in the last 12 months. Excellent = 4 , Very good = 7 , Poor = 1, it would show the data as Very Good, Excellent, Poor. Is there any feature allowing combine form submission and produce report ? Lets say I have 4 forms and I would like to combine these 4 forms submission and create report from Jotform. So, this page was great an explaining the different types of charts and options available to me, however, I can't find any information on how to add any of my other questions to the report and I know that I am suppose to configure that somewhere, but where would that be? Is it in the builder for each question? Is it in the visual report builder? Can't find an exact area as to where I add each question/section that I am trying to gather information for on the visual report. This can't be serious: it's functionality is rudimentary and user unfriendly. How to save visual report as PDF file? can we not save these reports as pdf? Also why are the colours based on whats most popular and not what the field type is? It look SO unprofessional. Really trying to avoid survey monkey... could someone help me please? Is there an issue as my form submissions are not linking up to my visual report I have created? I also see that my 'View Submissions' only show the date of the form submissions and no other data. I think there is an issue with your software - please help. The chart div margins are to large. When I embed in a container less than 400 px it cuts off half of my chart because of these margins. How can I change this? These visual reports have a lot of potential but still need a lot of development. They really need to include other field options eg. text boxes or from other widgets eg. calculated fields. Also really need an option for charts to be date based. For example show results for past week for a particular field. Date on x axis Field on Y.
I don't seem to be able to produce a bar graph that shows 0 responses to a question if none of the survey respondents selected that response. I would like my graphs to show bars for all 5 possible responses to each question, even if one or more response(s) was not selected. How do I do this? Why is your visual report form so non-user friendly? I need about 30 segments of a large application form analyzed for up to 200 responses and the template you provide only allows two segments to be shown. How does one add another 28 to this unfriendly template? You should make it easier, or even automatic the way adobe forms and google docs quickly generates data. The forms have been good for us so far, but this aspect is troubling. Think you can make your forms generate automatic data and then the consumer can pick and choose what he wants to utilize from the varied form questions? Help, please. I wish there was a way to create a pdf of the visual report so that I can share the results with my client rather than providing a link. Can visual reports be embedded in my website and update automatically as responses are received? I have a matrix field that reports the wrong way. The martix shows fine in the result emmail but when I print it out as a Visual Reort it doesn't show the Questions, and rating in a way that is nonsensical. What fucntion does the 'Entry Limt' field have? I have a survey that has 31 questions but only the first two question appear in the visual report how do I get the remaining 29 questions? My questions, which are quite long, don't entirely show up when creating my visual report. What's the trick to extend each graph's title? Is there a way of changing the colours of the charts? The "Visual Report" function only shows my first question, whereas I have many more in my form. Can you help? It'd be too time-consuming to create a separate report for each question. This is the same question as above, however, when I select "view answer" it takes to a page that will not load. I need to make a report with multiple pages from the same form. How can I rename the reports so I will recognize them without opening? The "Visual Report" function only shows my first question, whereas I have many more in my form. Can you help? It'd be too time-consuming to create a separate report for each question. Also I try to export the entire set of answers per PDF, something that the system doesn't allow (blocked at 20, whereas I have 200 submissions). Can you assist me on that too? Need it for a work report... thank you! My report will only show the first two questions too? Please help. I would like a Visual Report of submissions made on my site on a password protected page. This report will show submissions made daily, monthly, yearly. Is it possible to set up this Visual Report up only once? Or do I have to keep going through the Report Wizard everytime I want updated submissions total? help me. I have 10 quuestion on the form, but the grid report shows me only the firts one... Why?